Teens often need transportation to a variety of places including school, after-school activities, sporting events, parties or even just to visit friends. When teens are unable to drive themselves, they often rely on parents, friends, public transit and other non-motorized methods to get from place to place. Ride sharing services have recently emerged as another potential transportation option in many communities. The C.S. 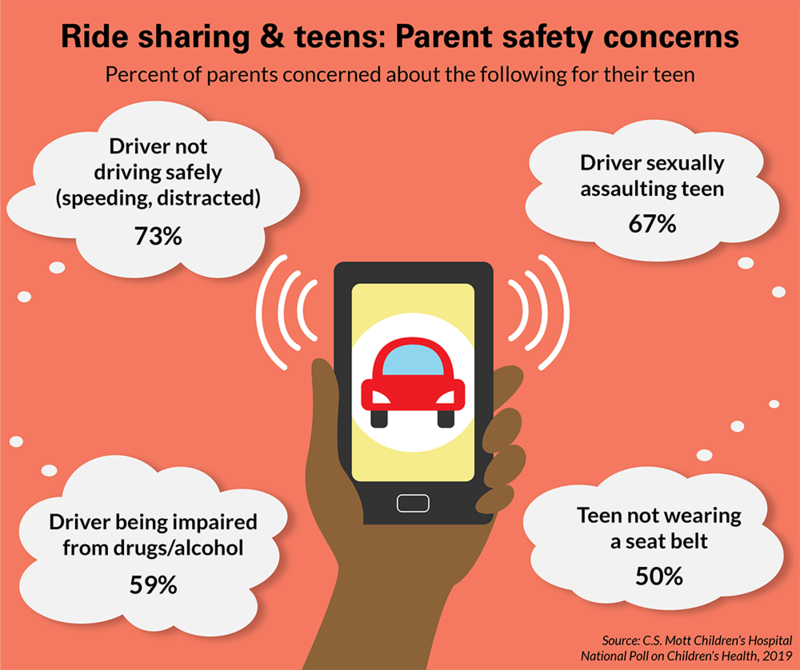 Mott Children's Hospital National Poll on Children's Health asked a national sample of parents about their opinions and concerns about their teens 14-18 years using ride sharing services. Overall, 1 in 8 parents (13%) reported their teen 14-17 years had ever used a ride sharing service, either alone or with another teen; this increased to 31% for parents of 18-year-olds. Parents in urban areas were more likely to report their teen used a ride share service than parents in rural areas (18% vs. 2%). Parents had several concerns about their teen using a ride sharing service. Around three-fourths (73%) of parents were concerned the driver would not be driving safely, such as speeding or being distracted by their phone. Over half (59%) of parents were also concerned about the ride share driver being impaired from alcohol or drugs. Half of parents (50%) were concerned that their teen would not wear a seat belt in a ride share vehicle. For some issues, parent concern differed by the age or gender of their teen, or by whether the teen had previously used a ride sharing service. Two-thirds of parents (67%) were concerned or very concerned that a ride share driver might sexually assault their teen. Concern was more common among parents for their daughters than for their sons (79% vs. 55%), and for teens 14-17 years compared with 18-year-olds (69% vs. 58%). No differences were seen between mothers and fathers. However, parents who reported their child had used a ride share, either alone or with a friend, were less likely to be concerned compared with those whose teens had not used a ride share about drivers not driving safely (62% vs. 75%) and sexual assault (55% vs. 68%). Most parents (70%) believe their teen should be at least 18 years old to use a ride sharing service by themselves or with other teens. A smaller proportion of parents felt they should be 17 years (13%) or 16 years (11%). Only 6% of parents thought teens should be 14 or 15 to start using ride share services. 1 in 8 parents say their teen 14-17 years has used a ride share service compared to 1 in 3 parents of 18-year-olds. Two-thirds of parents were concerned or very concerned that a ride share driver might sexually assault their teen. 3 in 4 parents were concerned the driver would not be driving safely, such as speeding or being distracted by their phone. Transportation is a challenge for many families; teens often have a variety of activities and social events, while parents have their own busy schedules. When combined with limited public transit options in many communities, ride sharing services may become a convenient option for families either on a regular basis or when they need help on short notice. Over the past few years, ride sharing services have become a common tool for adults who need a convenient way to get around and potentially an increasingly attractive option for teens and their parents to meet demands of busy schedules and active social lives. Although there have been reports of increased use of ride share services among teens, company policies of the major nationally known services prohibit teens under the age of 18 from riding without an adult. However, sometimes parents and teens in a bind for transportation have been shown to find ways around these rules and they can be difficult to enforce. It can also be challenging for drivers to verify a rider's age. Regardless, if teens do use a ride share service, there are practical and important strategies they can use to stay safe. A common concern expressed by parents in this Mott Poll is that their teen might be a victim of sexual assault. It is true that there is safety in numbers. A commonsense ground rule that parents should consider if their teen uses a ride share service is always having their teen travel with a friend or someone they know. However, this may not always be possible. If a teen is traveling alone, parents should take the extra step to remind their teen that they are getting into a vehicle with someone they do not know and they need to be especially alert and attentive to their surroundings. Parents also expressed concern about how safe the ride share drivers were on the road, including whether they were speeding or being distracted by their phone. Teens may feel awkward or inhibited to speak up if they notice a driver is not obeying the rules of the road. Parents can help by making sure their teen knows it is both appropriate and essential for them to speak out with regard to their safety. If a teen asks the driver to slow down or stop texting and they ignore the request or refuse to drive safely, the teen should request that the driver stops the car and lets them out. They should also report unsafe driving to the ride share service. It's also good to remind teens to always buckle up, even when sitting in the back seat. Parents should empower their teens to feel comfortable to refuse a ride if something does not "feel right" about the car or the driver. They should also instruct their teen to check to make sure that the car and the driver match the description provided on the ride share app. Once in a car, teens should use the app or pay attention to the route taken by the driver to make sure they are not heading to a different location. If that were to happen, parents should instruct their teen to ask the driver to immediately stop the car and let them out. Should the teen feel they are in any danger, they should call 911 for emergency help. Parents can also use technology to track the route of their teen to make sure the ride goes as planned. Having teens text or call their parent at the conclusion of the trip is always a good idea. In a limited number of communities, "kid friendly" ride sharing services have been launched that try to address some parental concerns for teens and younger children. These services usually have a specific pool of drivers from which parents can choose to interview and select for future rides. Parents may have the option of setting up a regular schedule and/or see which drivers are available at a specific time. Some services also have an app for parents to be able to follow the ride and the speed of the driver along the way. As parents and teens try to balance busy lives and multiple commitments, it is likely these types of services may spread to more cities. No matter what type of service is used, before teens use any ride sharing service, parents should discuss the potential dangers that may arise and develop a strategy with their teen. This report presents findings from a nationally representative household survey conducted exclusively by Ipsos Public Affairs, LLC (Ipsos), for C.S. Mott Children’s Hospital. The survey was administered in February 2019 to a randomly selected, stratified group of parents age 18 and older (n=2,032). Adults were selected from Ipsos’s web-enabled KnowledgePanel® that closely resembles the U.S. population. The sample was subsequently weighted to reflect population figures from the Census Bureau. The survey completion rate was 60% among panel members contacted to participate. This report is based on responses from 877 parents who had at least one child 14-18 years. The margin of error is ±2 to 4 percentage points and higher among subgroups. Freed GL, Singer DC, Schultz SL, Gebremariam A, Clark SJ. Are ride sharing services safe for teens? C.S. Mott Children's Hospital National Poll on Children's Health, University of Michigan. Vol 34, Issue 1, April 2019. Available at: https://mottpoll.org/reports/are-ride-sharing-services-safe-teens.